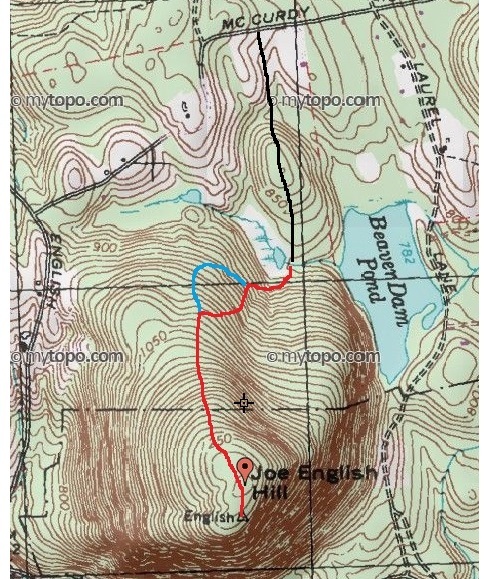 HockeyPucks hiking and highpointing: Joe English Hill - 1285 Ft.
From New Boston road, turn onto Bedford road. At "Sunday Driver Rock" turn left onto McCurdy road. Follow McCurdy 1.7 miles and turn left onto Joseph Rd. Joseph Rd is also called Summit road on some maps. Drive to the end and park at the cul-de-sac. From the Cul-de-sac at the end of Joseph (Summit) road walk straight ahead to the left side of a beaver pond along the gravel road (it has the appearance of a driveway). After .12 miles feet look for an unmarked 4x4 trail ascending left. Follow the 4x4 path to .34 miles where it connects with the gravel road. Turn left and follow the gravel road as it ascends rock slabs (use caution in wet conditions). This is the steepest and most technical section of trail. As you reach the summit proper the woods clear to a beautiful trail through sparse fir trees. At 0.75 miles you reach the summit pile of rocks. Other than the rocks there was no official markings. Continue a few hundred feet further to reach a beautiful outlook with 2 Adirondack chairs and a fire pit. The outlook offers great views towards the Uncanoonuc mountains and to the west. Joe English Hill is the highest point in New Boston and a prominent peak in southern NH containing a very enjoyable hike. The starting point has the appearance of a driveway giving you an uncomfortable feeling. The 2nd half of the hike is an incredible walk through beautiful open woods fir trees. Continuing past the summit a few hundred feet to the outlook is the highlight of this trip. In Spring the outlook is a stopping point for Raptor migration and you may see Hawks, Osprey or Turkey Vultures in the skies. At 0.12 miles you'll encounter the trailhead ascending to the left.